"Supporting the Welsh Ambulance Service in the Local Community"
COULD YOU BECOME A COMMUNITY FIRST RESPONDER (CFR)? Do you enjoy a challenge? Are you good under pressure and remain calm in an emergency? Are you proud of the community in which you live and want to give something back? Do you have free time to spare? 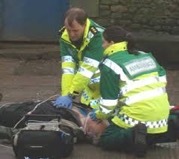 Are you ready to learn essential life saving skills? Have you got a full, clean driving license? Are you in reasonable good health? Are you over the age of eighteen? WHAT HAPPENS WHEN YOU JOIN A TEAM? A network of WAST support staff will train volunteers in life saving skills and how to use the equipment available to first responders. Before you start training, you will be required to have a CRB check, an occupational health check, and an ID card. When you are given your certificate of compliance, control rooms are alerted to the new teams and will alert the on-call volunteer when help is required. 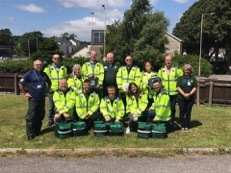 WAST encourages all teams to be self running, involving the appointment of a volunteer team co-ordinator to help independently manage each local scheme. If it’s a yes to all the questions then you are the person we are looking for to join one of our existing schemes or develop a new team. More more information please email us (click here).